Grain legumes are characterised by their nutritional value, an ability to grow rapidly and improve soil health by fixing nitrogen. This makes them a key rotation crop in promoting food security amongst smallholders in particular. However, yields are constrained by factors such as pests and diseases as well as vulnerability to poor soils, drought and other effects of climate change. This collection reviews the wealth of research addressing these challenges. 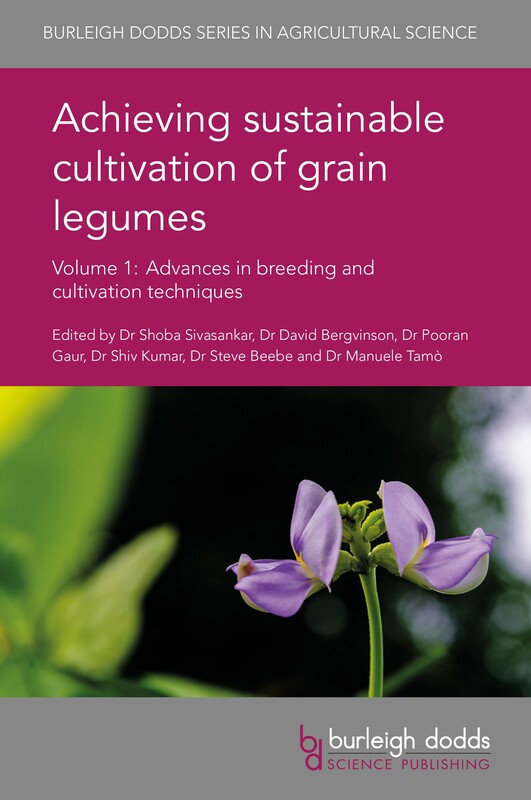 Volume 1 focusses on breeding and cultivation. Part 1 summarises advances in understanding crop physiology and genetic diversity, and how this understanding has informed the development of new varieties. Part 2 reviews improvements in cultivation techniques to make the most of these new varieties, from variety selection and seed quality management, through pest and disease management to storage and quality assessment. With its distinguished editorial team and international range of expert authors, this will be a standard reference for the grain legume research community and farmers of these important crops as well as government and other agencies responsible for agricultural development. It is accompanied by a companion volume which reviews particular grain legumes. Not sure what you’re getting if you buy this book? Click on the cover image below to open a PDF and preview pages from the book. .